Walking and cycling charity Sustrans warned that these "substantial health benefits" are only possible with long-term political commitment and investment in cycling. London has seen daily cycle journeys more than doubled since 2000 but levels have remained fairly static elsewhere, the report says. An estimated 34,000 incidences of serious conditions such as Type 2 diabetes, stroke and breast cancer would be prevented in eight UK cities if the number of cycling trips doubled every eight years between 2017 and 2040, researchers found. Sustrans calculated that this would equate to 242 million hours of additional physical activity, preventing 628 early deaths and generate £21 billion of savings to the economy. 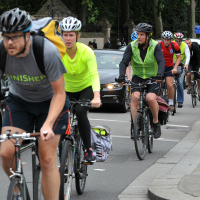 Xavier Brice, chief executive of Sustrans, said: "Our report provides 34,000 reasons why governments across the UK should prioritise investment in cycling. "Every part of the country is facing a physical inactivity and obesity crisis, which is why decision-makers need to get on the front foot and tackle these problems head on." Greater Manchester Mayor Andy Burnham said: "Cycling in Greater Manchester, like in many UK cities and regions, is increasing, although not at a pace we'd like to see. "We have a long way to go before we can call cycling a normal way to travel, which is accessible to all our residents." If you're thinking of getting on your bike while away, make sure you check out our travel insurance packages which have sports and activities automatically included.